There’s quite a bit of buzz about the benefits of co-authorship in Word 2010 when using SharePoint 2010. But what if you’re not using SharePoint? Sometimes what’s old can be new again. Master Documents in Word was a great solution when the power of the computer did not match the demands of the way we were using Word. A Master Document is a collection of links to other documents that can be viewed and printed as though it were a single document. So, how does this work? Generate a single document for each section of what will become your complete document. Even if one person is working on several sections, separating them out at this point will keep your document easier to manage and print later. Save them to a shared network drive or a document library on SharePoint. If neither of these is an option, and you have to send them out as email attachments, it might be best to save them back to a common location. You can include documents from different locations in a master document, but it might be more manageable if everything were in one place. Now, create another document and change to Outline view. You may either click on the View tab and click the Out­­line button in the Document Views group, or click the Outline button in the Status bar. You’ll notice the Outlining tab appears to the left of the Home tab. In the Master Document group, click the Show Document button. Now, you’ll notice that the Master Document group has expanded to include the Insert ­button. Click the Insert button and locate the document you wish to include first, then second, and so on. Be sure to respond in the negative about creating additional styles by choosing no to all, when prompted. You’ll want to use only the style, structure and formatting of the Master Document. At first, these “subdocuments” will appear in ex­­panded mode. In this mode, you can get an idea of what it will look like when it prints. Click the highlighted Collapse Subdocuments button and you will now see a list of hyperlinks. 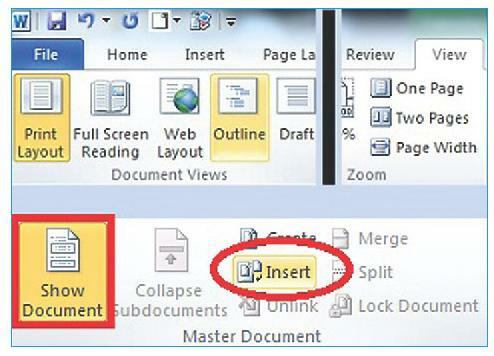 Use the Navigation Pane if you’re in Word 2010 to easily rearrange the order of subdocuments. You can now change the theme and rework the styles to suit your project. If styles have been used correctly in the subdocuments, changing the style for the document will change it in all the places that style is used. Before printing, make sure you have chosen to expand all subdocuments. Use print preview to make sure it lays out the way you like. Changes made in the individual subdocuments by others will be automatically reflected in the Master Document. To make changes yourself, collapse the subdocuments and use Ctrl+Click to open the documents and make your changes. Change multiple line spacing in Word 2007 and 2010, for good! Can this functionality be used in SharePoint?